Ta da! 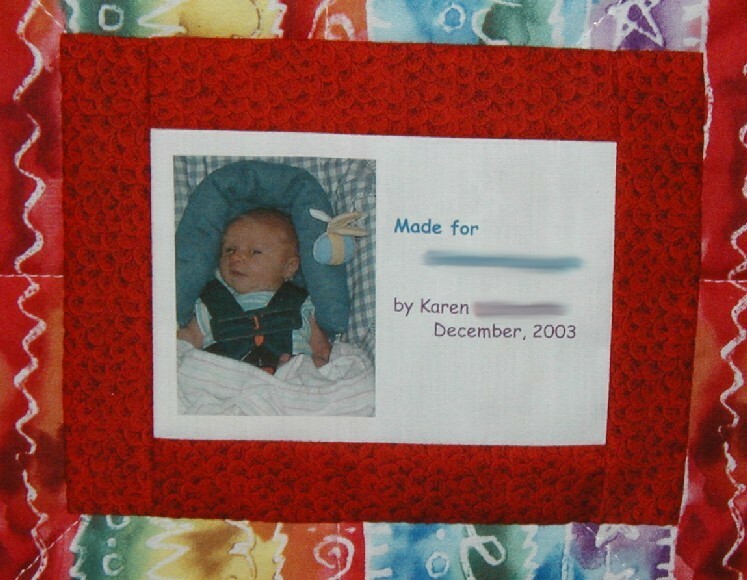 I finished another baby quilt, putting the last stitches in the label this morning about 7:15. It’s only been about two weeks since I finished the last one (less, if you consider that I was out of town for four days). I am on a roll. Now, it helps a lot that this is a very simple pattern that goes together quickly, especially if you strip piece, which I did this time. Also, this pattern is usually done with all the blocks being pieced, but I saved time by using a preprinted stripe in every other block. 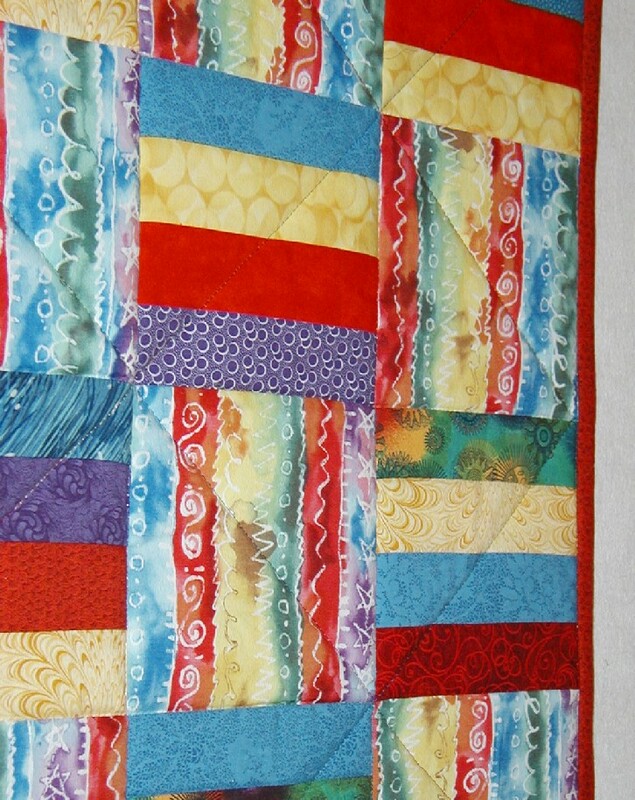 The quilting is simple, too, just in the ditch between the blocks with some of the diagonals highlighted in multicolored rayon. I felt a little guilty about rushing through this one, like I wasn’t giving my best and why should this baby get short shrift just because he happened to be born during a Purple Systems baby boom, but in the end I’m happy with how it turned out. 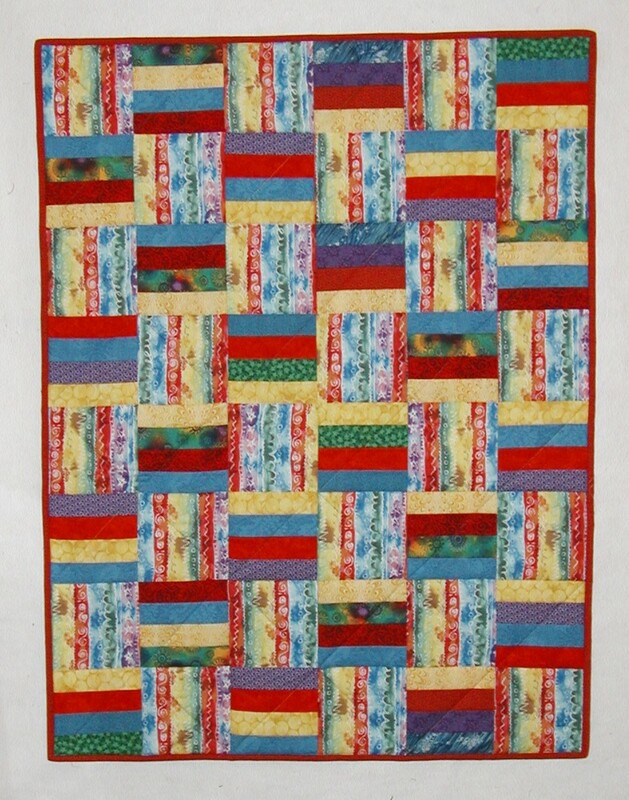 It’s not perfect, no; I don’t know that I’ll ever do a perfect quilt, but it’s nice and bright and the dad was happy with it. He thought it took a long time to make, and especially liked the picture on the label. I’m just proud of myself that I was able to find the picture for it in my overstuffed e-mail folders. Before I start my next project, I need to take a little time to clean up my sewing area. It’s overstuffed, too, with stacks of yardage from the last two or three quilts and little piles of scraps and the two bags of fabrics I got in Japan and another bag of material my mom gave me and I’m sure some surprises under the piles. I’ll work better when I get that cleaned up because I’ll be able to focus, and I know Mr. Karen will be happier, too. A year ago, I was looking forward to trying more improvisational quiltmaking after I caught up on ones for all the babies my coworkers were having. Ha! Even after making two quilts this month, I’m still two babies behind (soon to be three, since another is due January 8th). Maybe instead of providing free snacks, Purple Systems should provide free condoms.